Cover Reads: Mom, Thanks For Changing All Of My Dirty Diapers. 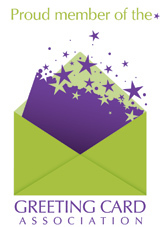 Inside Reads: I'm Praying That I'll Never Have To Return The Favor. Happy Mother's Day! Your mom faithfully changed your dirty diapers back when you were a cute little bundle of joy. Given the increase in the number of years people are living and the rising rate of adult incontinence, there's a good possibility you may be changing her disposable undergarments someday. 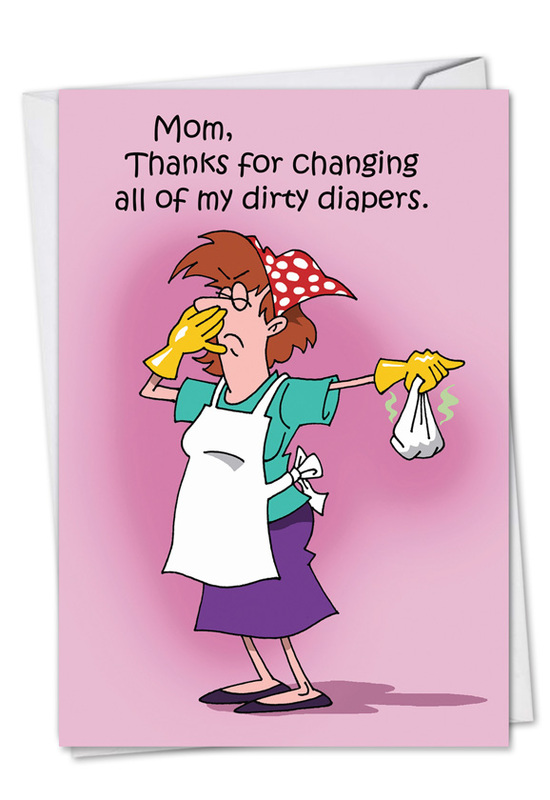 Remind her of this potential scenario with the Dirty Diapers Mother's Day Funny Greeting Card from NobleWorks Cards. 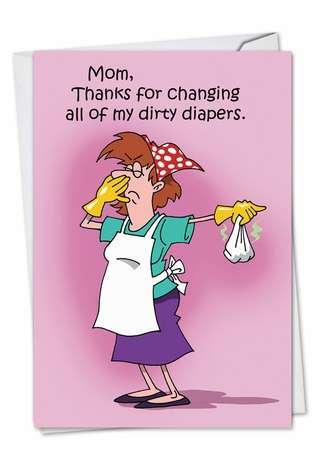 Perfect for children who can't stop razzing the woman who spent hours in painful labor delivering them, this edgy Mother's Day card is filled with dirty, stinky fun. The charming art of D.T. Walsh depicts a mother dealing with the toxic waste that came out of her sweet little angel. Inside is a message that turns all that on its head, and indirectly wishes an early death for your dear mother — you really aren't a very good kid, are you? Meh, your mom knows all about you, down to the most intimate details, which she’s discussed over the years with friends and relatives, and she'll still be able to push you around when she's 104 years old. Although this card isn’t scratch-and-sniff, its cover illustration is so realistic you and your ma will swear you can smell the fumes wafting off the paper. 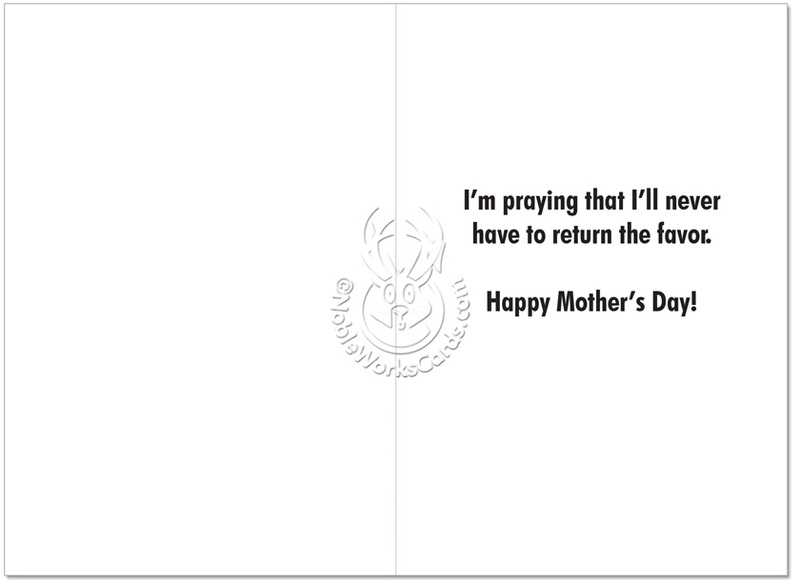 Since smells are the sense most closely connected to memory, this card is bound to create some really warm recollections for you and your ma. Perhaps a bit too warm, actually. 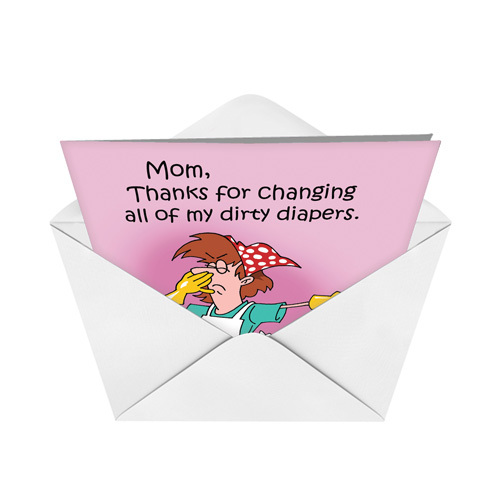 Let the fun times start with this hilarious diaper Mother's Day card. My mom absolutely loved this. She said she never laughed so hard.